There is something special about XTERRA Lake Tahoe. From the crystal clear blue waters to the mesmerizing views from above, this race is one of a kind and in my opinion one of the most challenging XTERRA races because of the altitude and climbing on the bike. Just back from XTERRA Dominican Republic, and home for less than 24 hours before XTERRA Lake Tahoe had me more than a little nervous. Not sure how the altitude or the lack of training would affect me, I set my alarm for 5am race morning and decided to give it a go. One of the special things about XTERRA is the people, the friends you make at every race. It’s those friends that got me thru race day, enjoying every moment. The race starts with a swim out in front of the Hyatt in Incline, the water is so blue you can see sand ripples almost the entire swim. If you aren’t careful you can get distracted following the sand ripples and fall off course! This year’s swim seemed particularly crowded, which is a good thing because that means there were a lot of participants! But at the same time it means you need to get out quick and away from the masses of swinging arms. It took me till the first buoy to find good rhythm and a good swim line. The lake was a pleasant temperature, and the clarity did not disappoint, although to be honest I did not spend much time this year looking at the bottom as my focus was on holding my line and keeping a good pace for the two laps! After the swim the true adventure begins with a 3 + mile mountain bike ride up sandy Tunnel Creek road, which to my surprise was in great shape this year most likely from the recent afternoon rain storms in our area. From there you pick up the Flume where the views of Lake?Tahoe are absolutely breath taking. Of course, on race day you don’t really have time to take in the view, so I highly recommend pre-riding the course! Once off the Flume you take a nice spin around Marlette Lake, did I say nice, this course has you climbing almost 4000 feet! But after all the climbing the descent down the Tahoe Rim Trail is one of the best descents in any XTERRA race, again in my opinion. With rocks and some great tight turns, I love the TRT because it’s technically challenging and makes for a fun and fast descent, if you know the trail! Once off the Rim Trail you head back down Tunnel Creek to where you started 22 miles ago! But we aren’t done here; there is still a nice 6.2 mile run ahead thru pines, aspens and creeks, don’t worry it’s a mostly flat run! Besides the challenges of the course all the views and scenery it offers, the other reason I love XTERRA Lake Tahoe is the people! 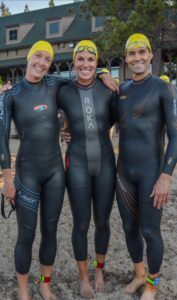 XTERRA’s really bring out a friendly group of racers, I am always amazed at how supportive and encouraging all the competitors are to one another through out the day. Thank you Big Blue Adventure, all the volunteers and support that went into making it a safe, fun and successful race for all that participated! I look forward to doing it again next year!